Up to 10,000 students can now be kept informed, entertained, and engaged with university content and information via a curved 7.5mW X 1.5mH NanoLumens display that can be seen from anywhere within the building’s lobby. 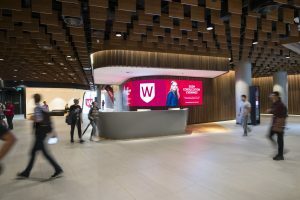 Western Sydney University thought in very big terms when it first envisioned building a new $220 million campus in the Parramatta City Precinct, the geographic heart of Sydney, Australia. The result is the university’s first ever ‘vertical’ campus that is now being used by thousands of students who pass through the 27,000 sqm, 14-story vertical campus every day! Keeping this many students informed and engaged with campus news and events might seem quite a challenge, but the consultants at Digital Place Solutions (DPS) knew that NanoLumens, the industry leading manufacturer and marketer of LED visualization solutions in any size, shape or curvature, would have just the right solution to meet the challenge. 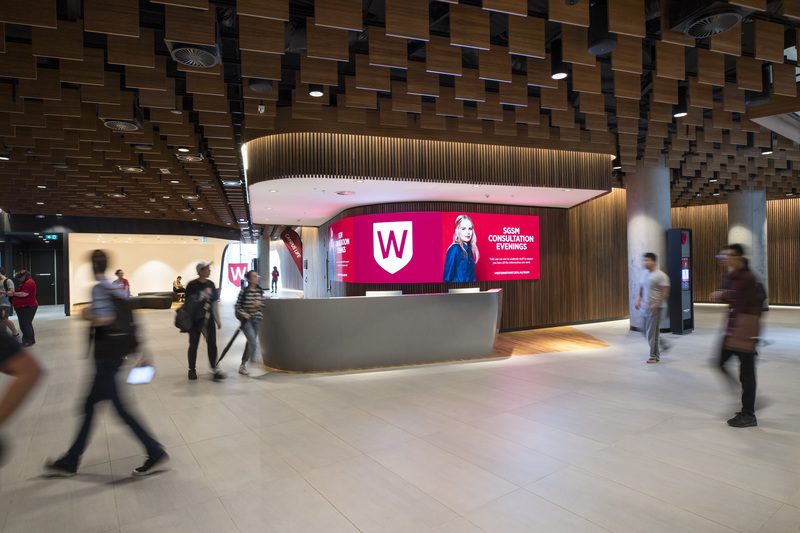 The result, according to Digital Place Solutions Co Founder Stephen Rubie is a stunning NanoLumens ‘true curve’ 4.7mm pixel pitch LED display that wraps around a curved central wall in the new university campus hub. The curved NanoLumens display sits directly behind the campus’s information desk and had to be formed to fit the vision of the architect. The display is perfectly curved to match the curve of the wall, which means that the architect’s vision of being able to showcase dynamic images on seamlessly curved wall could be realized. The display actually curves past 90-degrees back into an acute angle and the off-axis viewing and colourimetry of the NanoLumens display is exceptional. Western Sydney University’s new vertical campus is the technological epicenter of a larger $2-billion Parramatta Square urban redevelopment program that will be a showcase for smart city technology and the benchmark for future development in Parramatta City.